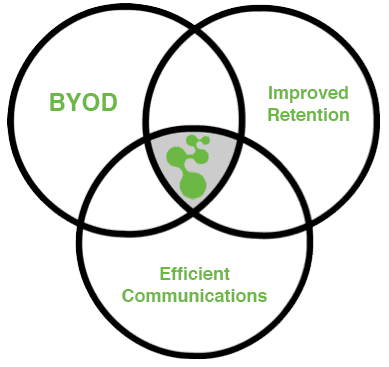 Increase patient engagement, reduce study dropouts and improve compliance by communicating with patients on their personal devices (BYOD). Using text messaging and mobile web-based Patient Engagement Portal (PEP) platform, Mosio’s patient retention software for clinical trials enables you to deploy secure, cost-effective retention programs without the need to download native apps or provision mobile phones. Mosio was designed with every patient and mobile phone type in mind. 95% of mobile phones have text messaging. It’s the “app” on nearly every mobile phone. Text messaging is the number one data service in the world. Why Text Messaging in Research? Email and phone calls are not as effective for engaging patients. 23% of phone calls go straight to voicemail. 30% of voicemails linger unheard for 3 days or longer. 90% of emails are spam. 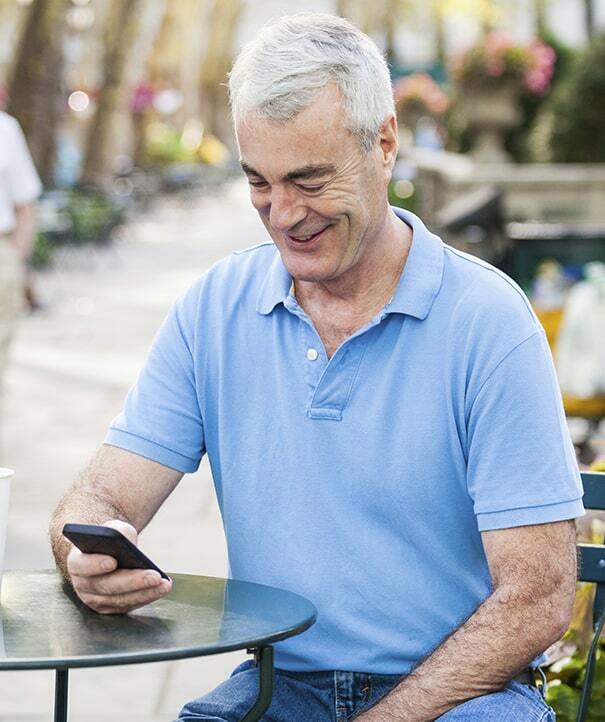 Text messaging enables patients to use their own mobile devices. 91% of mobile users keep phones within arm’s reach 24/7. 90% of text messages are opened and read within 3 minutes. 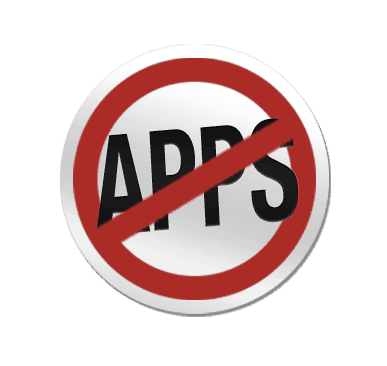 With text messaging, there is nothing to download, no app versions to update, and no device “tech support” requirements by research staff. Mobile messaging platform providing two-way texting in 50+ countries. Utilizes text messaging and responsive web technologies. Created to be accessible by the largest number of patients. Cross-platform, providing sponsors with accessible, simple software, usable by all patients. With Mosio, you can manage powerful, engaging patient retention programs, available to the largest number of patients, on the technologies they already use. Fix your “no show” rate. Merge Field™ technology enables you to inject patient first names in the message. Schedule single appointments or in batches. “Nudge” reminders can be sent for non-responses. Notifications to study staff when cancellations occur for quick rescheduling. Keep tight dosing schedules and ensure desired actions are completed. Medication adherence or compliance reminders help patients stay “on task” with protocol requirements. Notifications are sent via text message. Patients can then login to the Patient Engagement Portal (PEP) for additional private information or to have two-way communications with the site regarding dosage administration. Reminder and confirmation of dosage administration. Recording of taken and missed doses. Tracking of other medications being taken. Guides or instructions on taking medications properly. Code phrase messaging for patient privacy. Quick access to helpful information. 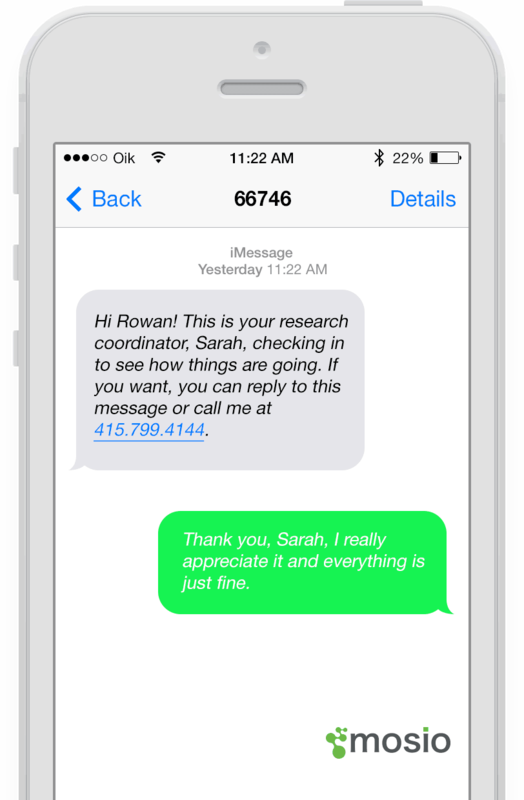 Secure, two-way messaging for the patient to ask questions. Deliver encouragement, gift codes or update patients about funds being added to their pre-paid account. Schedule a series of automated messages to be sent to patients while they are participating in your trial. 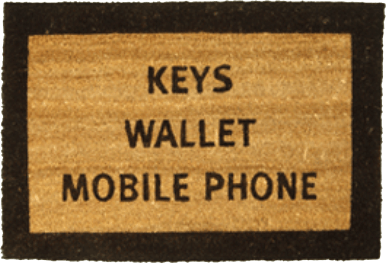 They can show appreciation, offer to assist whenever needed or include information related to incentives delivery, such as gift codes or pre-paid debit cards. Integrate seamlessly with third party payment vendors. Show appreciation and build trust. Add gamification elements to your study. Improve patient satisfaction by gathering feedback at the point of experience. Patient-centricity starts with asking for honest feedback from patients. Collect instant feedback from patients about their experience during the trial and avoid the sluggishness of paper. The faster information is gathered, the quicker changes can be made to systems and processes. Surveys can be sent automatically at pre-determined times after an enrollment date. Any survey question that can be asked can be configured on the Mosio platform. Collect actionable feedback in real-time. Send nudge reminders for non-completion. Provide gift codes via text message for completed surveys. Looking for a patient retention program for your upcoming study? Contact us for a capabilities presentation and quote. Up to 80% of trials experience loss to follow-up challenges. 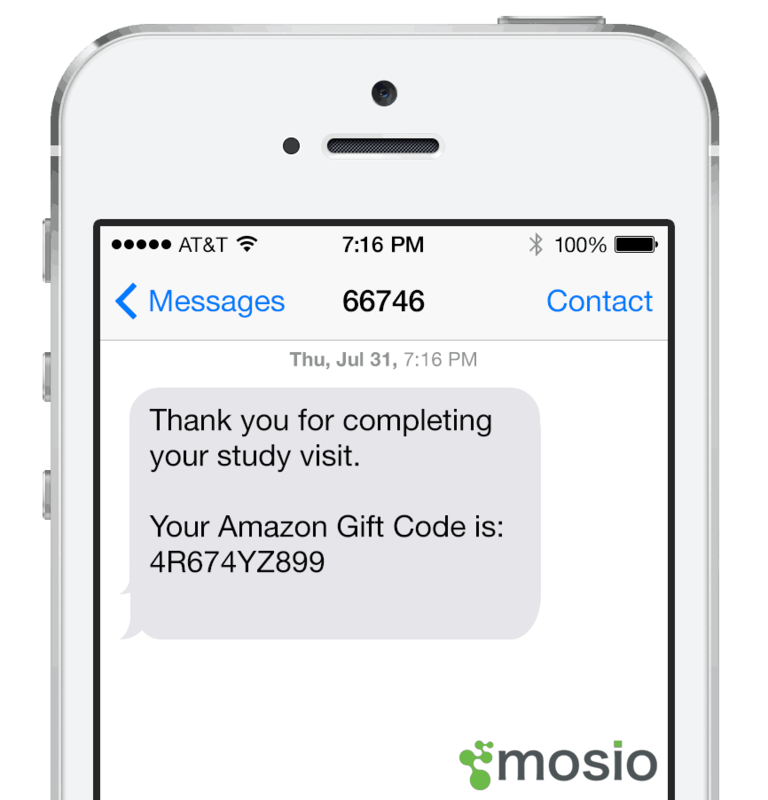 Mosio’s suite of services enables research teams to keep participants engaged through two-way communications, timely alerts, and data collection methods easily accessible via mobile devices. Text messaging’s myriad of use cases (ie, newsletters and helpful details, appointment reminders, medication adherence, showing appreciation, etc) are known to improve patient engagement and reduce loss to follow-up, allowing trials to more swiftly proceed to regulatory approval. Better adherence and compliance leads to improved retention for trial participants, decreasing development costs and improving the speed of bringing new treatments to market. 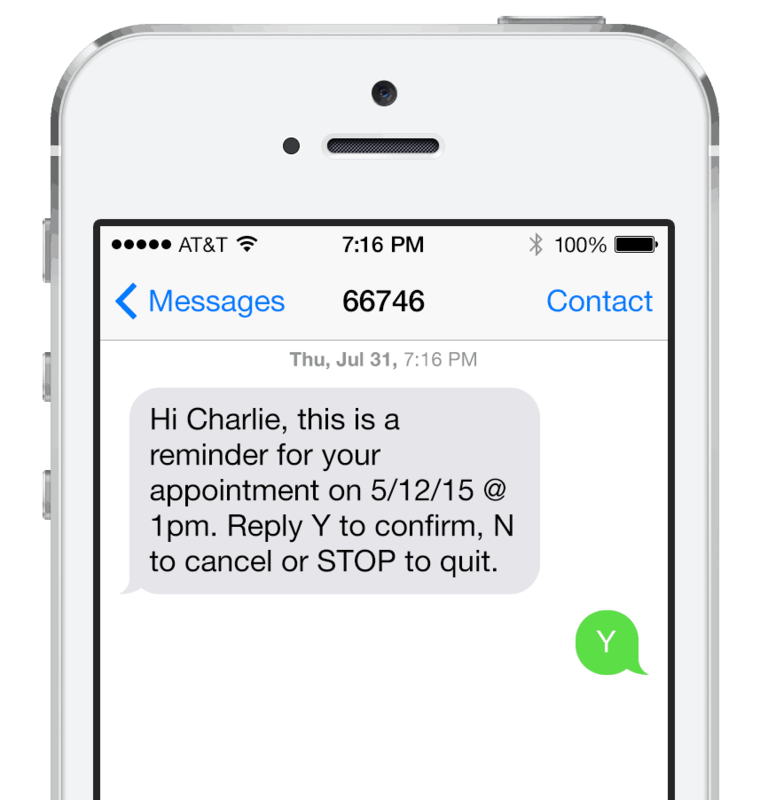 Text messaging is a proven method of increasing medication adherence. Mosio’s platform builds on the strength of the text messaging channel by giving you the ability to send alerts at specific times of the day, ask for a reply that a patient has complied and even send a reminder follow up when no response has been sent. With Mosio, patients are more likely to be adherent and better informed on how to take their treatment, contributing to more accurate dosing profiles.